November rounds off with a special marabi-flavoured mbaqanga female vocal treat from 1973. Listening to this great album, I am left wondering what factors, other than great voices and muscial ability, meant that some South African female vocal groups briefly burnt bright, while some others endured. I am just sorry this bunch did not last much, much longer. The “Girls of the Wind” deliver velvet under-stated harmonies in swaying sync to the Zwino Zwino Rhythm Boys. If you like the Dark City Sisters and that sort of music you are going to fall in love with this gem. While West Nkosi compiled this album, Rupert Bopape is acknowledged as “the man” who guided Thandi Nkosi’s group to a Mavuthela contract and stardom. Bopape and Shadrach Pilliso team up to write three of the songs, while the ‘Izinitombi’ members, provide the bulk. “The organ, the lead guitar and the bass guitar provide lovely phrases that bring marabi to your doorstep. And if you feel like jumping up and doing your thing just remember you have the sweet voices of the girls to listen to”. (from the cover). Vocalists: Thandi Nkosi, Peter Phalime, Maria Moriri, Caroline Kapenter, Felicity Masondo, Sylvia Dlamini, Eunice Simelane and Thandi Mazibuko. 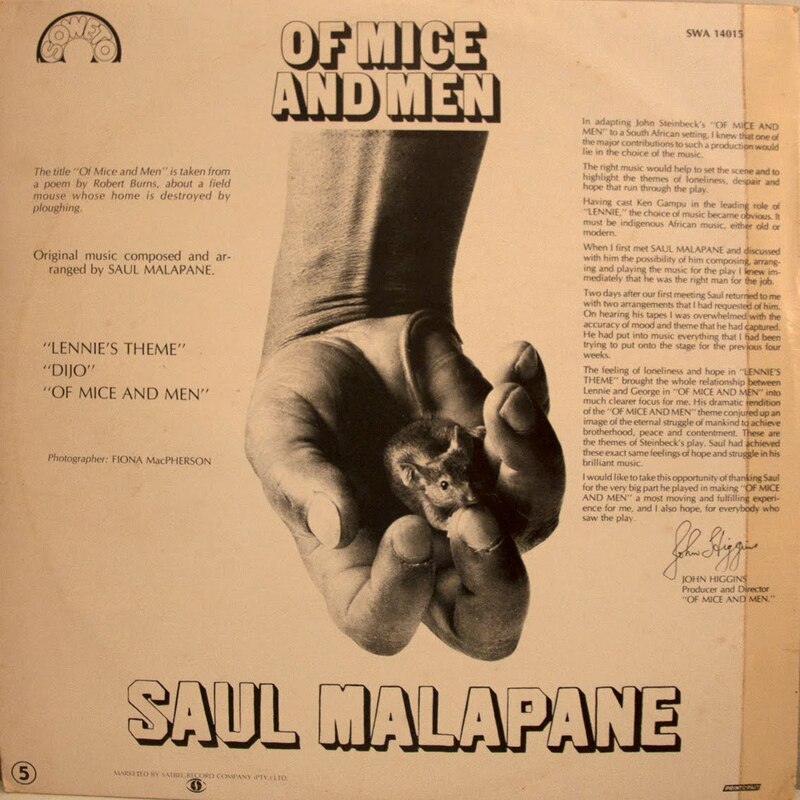 An absolutely incredible album from Saul Malapane and I suspect members of the seminal mid 70s jazz group The Drive (more from them soon!). Just three long tracks that Saul was asked to compose by John Higgins, the producer and director of the 1975 stage production of Of Mice and Men. 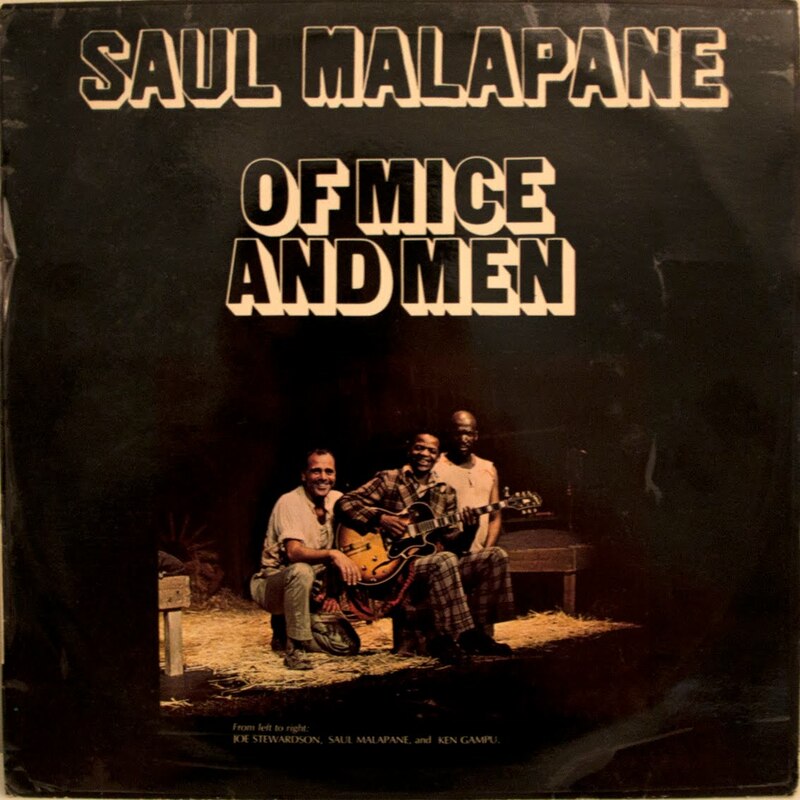 Saul Malapane was born in Warmbaths in 1943 and moved to Johannesburg in 1965 to earn a living. He worked as a gardener and did occasional house painting for extra income. One employer gave him a guitar as a Christmas present and encouraged him to take up music. He took some lessons with Gilbert Stroud and joined the group The Drive, who used Stroud's premises to practice. The stage show in Johannesburg caused a stir in the newspapers and internationally as the black actor Ken Gampu had to be given permission by the department of Bantu Administration to appear on stage with white actors. "For the first time, the black man was on an equal footing with the white man," he told an interviewer. "And you know, the heavens didn't fall." Coming back to Electric Jive land from Ghana via Lake Victoria and this snappy and sweet bunch of Swahili Hits - with the record pressed in Johannesburg for the Lake Victoria Label. 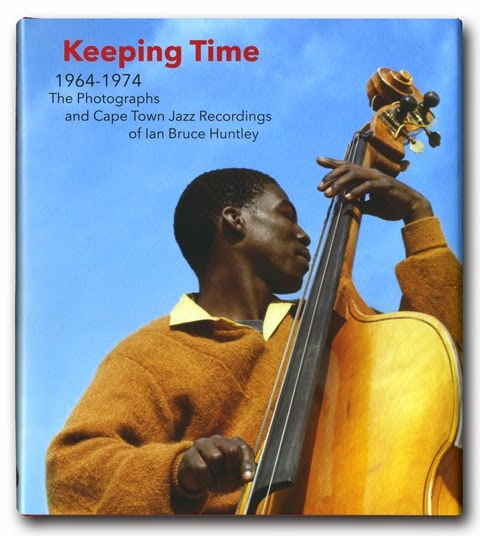 Doug Paterson outlines Kenyan styles of music from this era: "Although the melodies, languages, and rhythms may vary from song to song, one of the common traits ... is the preeminence of the guitars. They weave their way through the vocal portion, meshing with the melodic line or answering it and, nearly always, they finish out the last minute or two with some ear-catching solo jam." Doug's excellent overview of Kenyan pop can be found here. Some more info on the Lake Victoria record label can be found here. Something quite different today. 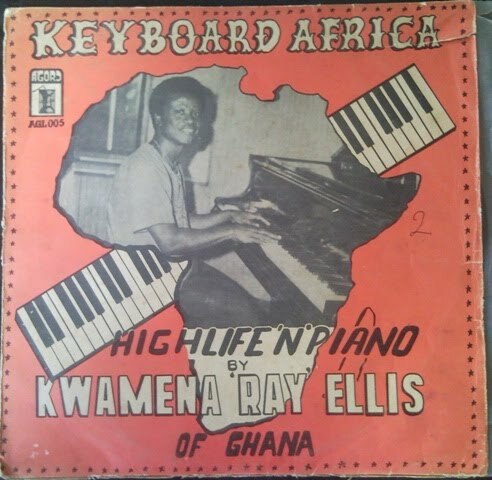 This is from the same batch of Ghanaian LPs some of which were shared earlier at electricjive. 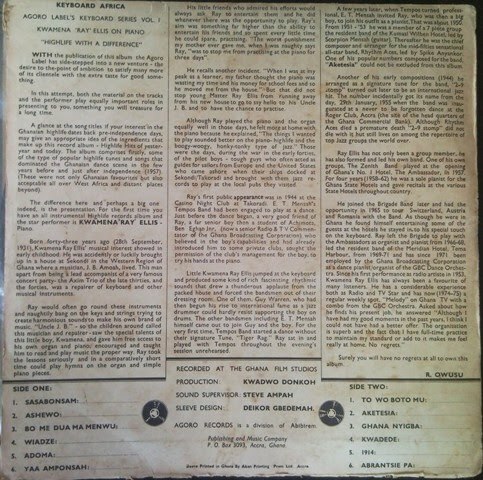 Aside from the sleevenotes on the back cover not much more information has been forthcoming and so, without a deeper context, we invite you to have a listen and tell us what you think or to fill in the gaps for our readers. Seven-piece instrumental jazz 'n jive (1976) produced by Roxy Buthelezi provides a pleasant surprise. 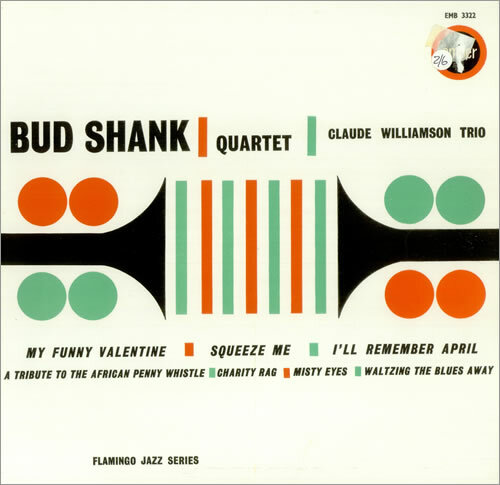 The horns, keyboard and guitar arrangements give a sense of relationship to better known recordings such as Sikiza Matshikiza and some of the Movers. The album also contains some fine accordion-driven mbaqanga, as in the track Lobambo; and saxophone-led Four-Way Stop. There is no information about band members available. Anyone recognise the artists on the cover? All songs except for Lobambo (Khanyile/Pootuna) are credited to the producer, Roxy "Black Cat" Buthelezi. Buthelezi produced and worked closely with Engineer Owen Wolf with various bands, including The Additions; Venanda Lovely Boys and the Mthembu Queens. Buthelezi was also an announcer on the "Bantu" service of the South African Broadcasting Corporation. 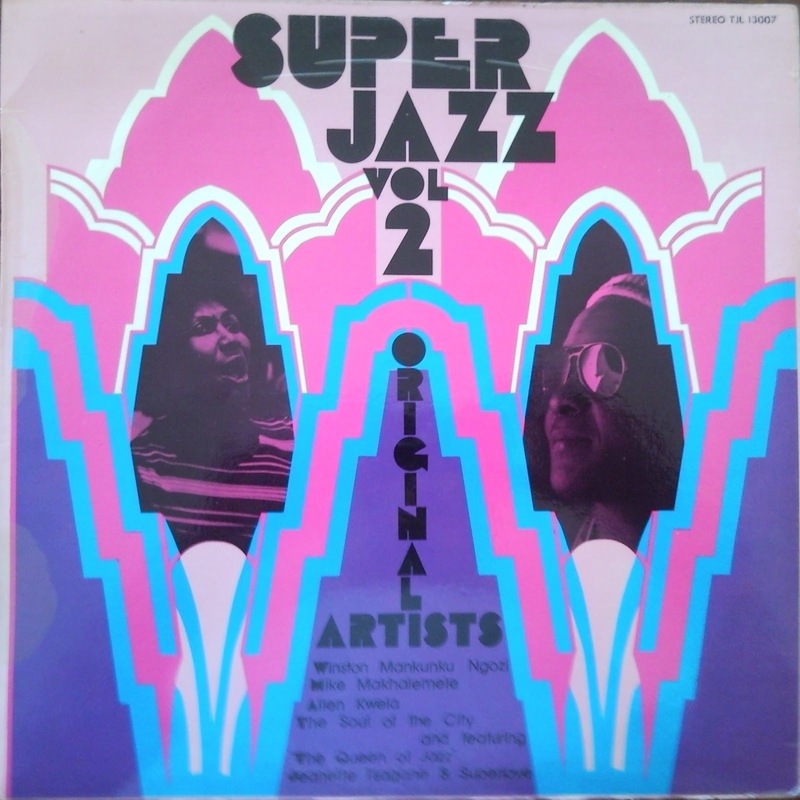 Its true, Duke Makasi, Robbie Janssen and Mervin Afrika of Spirits Rejoice cut a disco album with Julian Laxton and some others in the same year (1977) they produced their cult-status Afro-Jazz Fusion "African Spaces". A pretty funky effort at what they call "disco-jazz" it is too! Producer Patrick Van Blerk had this "Soul of the City" thing going in the mid seventies, bringing together trop-drawer black and white South African recording artists to produce rather interesting hybrid sounds. So far EJ has knowledge of two albums and one additional song on a compilation - all of which we share with you today. In his 1975 "Soul of the City" offering, the African jazz oriented "Diagonal Street Blues" boasts Kippie Moeketsi (alto sax), Mike Makhalemele (tenor sax); Themba Mehlomakulu (trumpet) Trevor Rabin (guitar); Kevin Kruger (drums) Malcolm Watson (guitar). "THE SOUL OF THE CITY were born out of JOHANNESBURG, South Africa, and reflect the music and feelings of "Egoli" - the City of Gold. ... Get down and feel the soul of the city; the warmth, energy, love, violence, rhythm, gold, soul, hate and passion; THE SOUL OF THE CITY". (from the 1975 back cover). In the 1977 "disco-jazz" offering, "Dazz", we have two extended tracks totalling just over twenty nine minutes of 70s looping dance-floor disco that just begs and deserves to be played for an "up-for-it" audience again. The line-up includes three core members from Spirits Rejoice along with Julian Laxton (guitar); Neil Cloud (drums); John Galanakis (keyboards); Rene Veldsman (vocals); Frankie Gibb (vocals). The album notes give a "very special credit: To the wonderful Spirits Rejoice for joining the Jo'Burg Records Family. Welcome!". It was perhaps a sign of the times that artists spent a lot of time in the studios in the mid seventies - thrown together in various combinations - and less on the road playing concerts as specific bands with a set membership. In the same year (1977) Duke Makasi and Kippie Moeketsi teamed up with Pat Matshikiza, and two other Spirits Rejoice members, Sipho Gumede and Gilbert Matthews to record "Blue Stompin" with Hal Singer on Rashid Vally's As-Shams label. 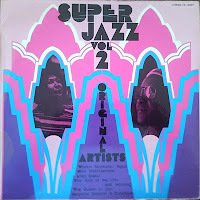 A bonus track from Soul of the City project is "Hustle Bump" off a "Super Jazz" (Vol 2) collection. Enjoy the upbeat diversity produced by a bunch of creative South Africans pushing all sorts of boundaries in mid-seventies Johannesburg! If anyone has other recordings of the "Soul of the City" adventure, please do let us know.